At the moment I wish I was dog’s best friend. Roxie misses the girls. They’re off on a two concert weekend tour. Since noon yesterday I’ve been in charge. I left for work around 3:00 PM leaving Roxie in her crate gated community. Cheryl came by twice in the evening to walk her and give some human companionship. I took over again at midnight. Within thirty seconds of walking in the house Roxie was singing to me from upstairs. She wanted out. When I pulled the latch and swung open the door it was like a jailbreak! She took care of her business, finished her kibbles and had a little water. I took her with me as I went to change. This was an unusual time and place for her. As I went to the closet she sprinted down the hall to Stef’s bedroom coming back with a pair of thick woolen socks. It was adorable to see her jogging down the hallway with the sockball in her teeth though larger than her head! We’re really not dogproofed upstairs so I closed the doors and continued my late night preps. Roxie usually sleeps with Stef. She often burrows deep under the covers ending up near Stef’s feet. When Stef has been away Roxie has slept with Helaine and me. She was having none of this last night! She jumped off the bed–a terrible thing for a short legged, long backed doxie. Then she began doing wind sprints through the bedroom. Low to the ground like a dragster, she reaches top speed almost immediately. It’s tough to catch Roxie when she doesn’t want to be caught. That little doggie is fast! 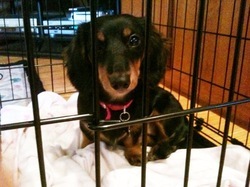 Long story short, Roxie ended up spending the night in Stef’s bedroom in the crate. Not my fondest wish, but my hands were tied. She just wasn’t interested in spending quality time with me and she couldn’t be trusted on her own. It’s obvious she misses Helaine and Stef. They are her primary care givers. She’s showing it as a dog shows things. That’s sad. Hopefully she’ll relax over the next 24 hours. Poor Roxie, stuck in the doghouse. I bet She’s gona be complaining when the girls get back. Where’s Rick Springfield playing this weekend?